Having already gone against the wishes of Alaskan voters and approved the aerial killing of 100% of the wolves in a 1,700 square mile area near McGrath, the Board of Game is expected to expand the aerial shoot to include a second and possibly a third area of the state. Plans call for killing 100-130 wolves in a 7,800 square mile area near Glennallen, and a similar number in an equally large area west of Cook Inlet. The Board of Game is having a telephone conference from Fairbanks on Monday with a listen only speaker phone available at the Fish and Game office listed below. The Media will be there and we are having a peaceful candlelight vigil to show our support for the wolves and to voice our dissatisfaction with Murkowski for increasing the aerial wolf control. We will have altered Christmas carols, hold signs with the truth written on them and try to shed some light on the REAL facts the Board of Game wants to keep us all in the dark about. 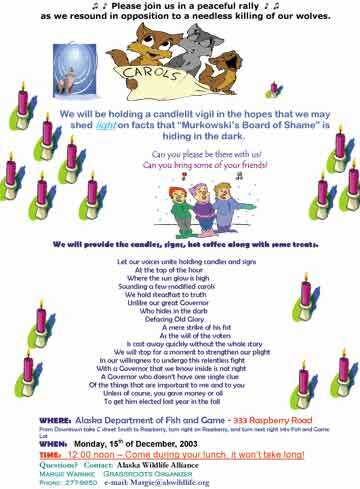 We are having this vigil on Monday, December 15th , at 12:00 noon , outside at the Alaska Fish and Game Office at 333 Raspberry . From downtown heading South on C street, go to Raspberry, turn right on Raspberry. The parking lot and building is on the next opening on the right side of street. The press will be there and we need to show the Board of Game and Murkowski that a lot of us don't agree with what they are going to do to our wolves. Plus, if we get enough support there is a great chance we will get some national press---which could help put more pressure on our Governor!! !